Franchises benefit from corporate advertising such as television and radio spots, coupons, newspaper inserts and more. But individual franchisees can't expect to succeed by resting on the efforts of others or broad-sweeping efforts performed in a catchall fashion. It's up to you, as the local franchise owner, to coordinate and implement marketing campaigns that will rally favor within your community. Because they are flexible, customizable and proven to work, inflatables have always had a natural affinity with franchise sales and marketing. Here are Just a Few Ways Incorporating Inflatables into Your Plans Can Pay Off. Promotional Item Giveaways - Inflatable key chains, balls, picture frames and more can be branded with your logo and location. Since everybody likes to win something, have regular drawings for prizes or offer to give promotional items to the first X number of visitors every Tuesday during certain times. You generate good will and provide a way to remind customers to visit your store again soon. Inflatable Product Replicas - Want to stop traffic in the streets and on the sidewalk? Place an inflatable product replica in your parking lot or on your roof. As if their size wasn't enough of a show-stopper, giant inflatables also give a lift to franchise marketing because they are colorful. Since they are exact replicas of your products (just much larger!) and not something typically seen every day, curiosity takes hold and customers can't help but walk in to see what's going on. Inflatable Mascots - Similar in size and function to inflatable product replicas, these are giant, identical representations of your corporate mascot. Due to the emotional connection mascots make with customers, these inflatables have a big draw with franchise sales and marketing campaigns. Inflatable Costumes - They walk, they talk, they shake customers' hands. 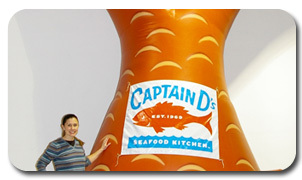 Inflatable costumes add life to any promotion. A combination of inflatable, mascot and costume: these are inflatables you can wear. A built-in fan gives the costume its shape and keeps the person inside cool. Advertising Blimps - Want to see sales soar? Take flight with helium-filled advertising blimps. This familiar shape is customized with your franchise's colors and logo, then anchored outside your location. Customers will be able to spot you from miles away. Because inflatables are easy to set up, deflate, pack up and move, they work wonderfully for use at multiple locations. Want to kick your franchise marketing up a notch? Inflatables do the job for quick-service food restaurants, tax-preparation offices, auto-parts stores, hair salons and many others. Check out the wide variety of available options that can boost traffic to your store. Need some creative ideas for franchise marketing? View our franchise inflatables gallery!